What's Up New Haven: Fun N Fit Day at the JCC: FREE Fitness Classes for Everybody! Fun N Fit Day at the JCC: FREE Fitness Classes for Everybody! Where are my New Years resolutioners?? Whether you're looking to get fit, get social, slip into those skinny jeans you bought over holiday sales -- whatever your goal, here is a FUN, FREE fitness idea for you to entertain. 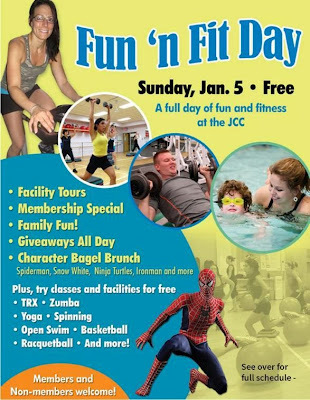 The JCC of Greater New Haven is hosting a Fun N Fit Day on Sunday, January 5th. All classes are FREE and non-members are welcome. Have you been wondering what the Zumba or TRX hype is about? This is a great day to explore those classes in a positive environment! View the complete class schedule here. In addition to fitness classes, there will be a Bagel Brunch featuring your kids' favorite superheroes, as well as facility tours, open swim, membership specials and more! New Haven Public Transit: Bus B3 will get you there!